A super cool twirling keychain that gets personalized front and back with your name and sobriety date. (Of course, other personalization options are accommodated whenever possible). The rosewood center spins independently from the maple wood outer ring which also happens to spin on the bright chrome split ring key assembly. A super nice recovery gift for anyone in the program! Please provide the NAME (or message) exactly as you would like it to appear on your keychain. 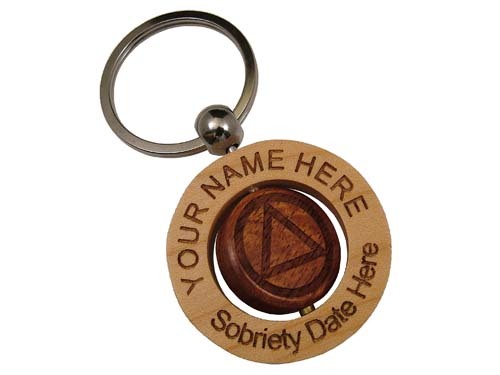 Please provide the Sobriety DATE (or message) exactly as you would like it to appear on your keychain. Do you have a great idea for a new recovery keychain or gift? Looking for a special keychain with your design, art, photo, etc.? Have a special event coming up? Please let us know! We'd love to help create something special just for you!